As a young boy growing up in North Carolina, Romare Bearden listened to his great-grandmother’s Cherokee stories and heard the whistle of the train that took his people to the North—people who wanted to be free. When Romare boarded that same train, he watched out the window as the world whizzed by. Later he captured those scenes in a famous painting, Watching the Good Trains Go By. 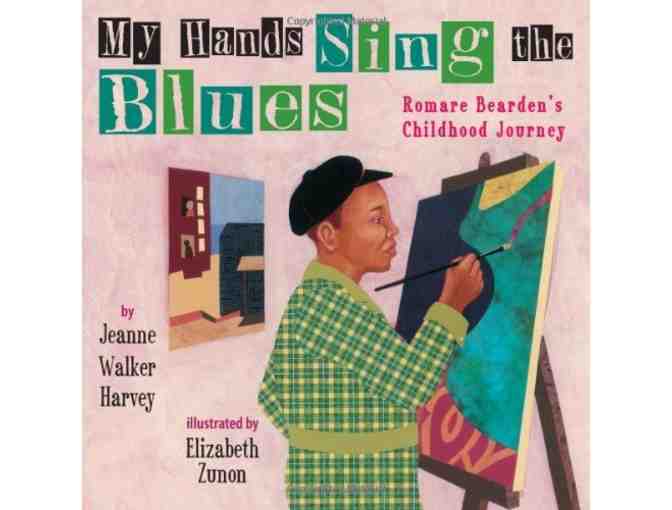 Using that painting as inspiration and creating a text influenced by the jazz that Bearden loved, Jeanne Walker Harvey describes the patchwork of daily southern life that Romare saw out the train’s window and the story of his arrival in shimmering New York City. Artists and critics today praise Bearden’s collages for their visual metaphors honoring his past, African American culture, and the human experience. Elizabeth Zunon’s illustrations of painted scenes blended with collage are a stirring tribute to a remarkable artist.